212. MAUVISSIRE to M. DES MARETS. 213. COBHAM to [the SECRETARIES]. I received your two letters by this bearer, since which he has been at Monsieur's Court. By his dispatch it will appear what devotion Monsieur has to her Majesty and 'dispositions to his ceremonies, or that it will like him to obtain the company of her Majesty though he bestow his prayers accompanied with a few.' I can learn no particulars from this messenger concerning the matter of marriage. M. Simier sent me a letter with a few courteous words of 'accomplements' only. It seems that Monsieur intends to undertake the enterprise of the Low Countries if it be in any way agreeable to his mind ; and his followers are gathering companies secretly. Whether this little beginning will have any other proceeding, God knows ; since the manner here has been to make many beginnings, but to finish few. As they go forward in their proceeding, I will not fail 'but' to advertise ; so that her Majesty may think of what shall be best for her safety. In my last I sent a dispatch touching the affairs of Portugal, which if it may be dealt according to that wisdom wherewith you have heretofore managed the like occasion, it will become I hope as good a safeguard on that side as Flanders is now for those parts, between the enemies and your harm. I trust you will let me understand wherein I may most stand instead in my service that I may the better satisfy your desires, which I have a good wish to perform. I humbly recommend my suit to your furtherance ; I think Mr Secretary Wilson has moved it for me of late. You have means that way to bind me and mine much to you. Copy. [France IV. 40 (39).] At end is : here endeth the dispatch sent by John Wells the 12th of March, and followeth the packet sent by Charles Cooke the 20th of March. 216. The KING OF SPAIN to DON ANTONIO. 218. CAPTAIN JAMES SYDEE to [? the ALCALDE of FERROL]. 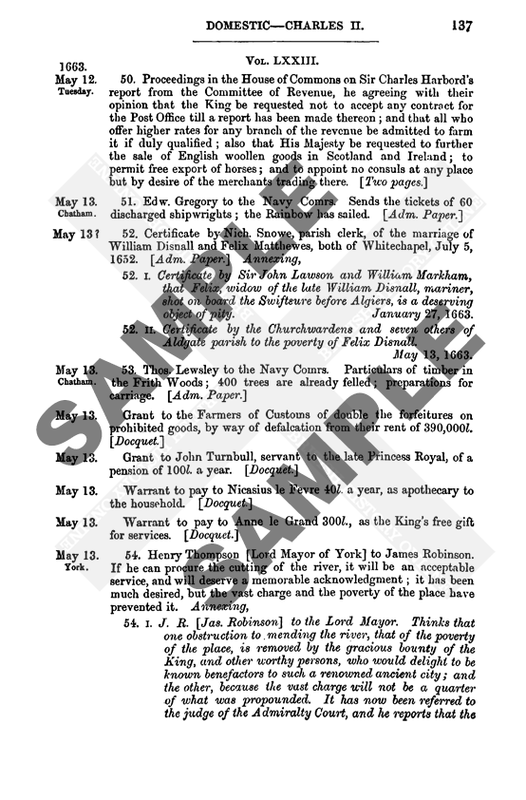 At end is : here endeth the dispatch sent by Charles, and followeth the packet sent by Adams the 27th of March 1580.